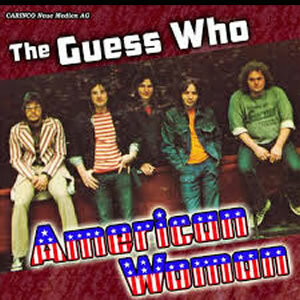 American Woman is a song by Canadian rock band The Guess Who, first released in January 1970 on the album of the same name and later in March as a single, which reached No. 1 on the Billboard Hot 100. The song has been covered by many rock artists, including, Lenny Kravitz and Krokus. The song's origins took the form of a live jam at a curling rink concert in Waterloo, Ontario. The group was rushing into the second set and began improvising a rhythm to liven up the crowd. Burton Cummings, the lead singer, began improvising lyrics to fit the music. They liked what they had played and noticed a kid with a cassette recorder making a bootleg copy and asked him for the tape.The subsequent studio recording features the original almost completely unchanged; only a few lines were added. Shortly after its release, The Guess Who were invited to play at the White House. Because of its supposed anti-American lyrics, Pat Nixon asked that they not play "American Woman". The story told to me by Randy Bachman During a break to replace a broken guitar string at the curling rink concert Randy stumbled onto the American Women riff. He quickly got the band back on stage and continued to jam the new riff and then turned to Burton and said "sing something". Burton freak not ready to improv a rock song and ended up with the words "American Women" as in the "Statue of liberty". Just prior to that show they were lost on the US side of the boarder and were almost tricked into driving down a one-way road that lead to a military post loading boys onto planes to Vietnam.